In this last chapter of our conversation with Jim Arnosky, we talk about the author’s favorite animals, Frozen Wild, climate change, and giving nature a chance. I’d love to hear your thoughts on this series. It was a great pleasure to speak with Arnosky, and I hope his words provide value to budding artists everywhere. Basbanes: Your most recent book, Frozen Wild, explores what winter is throughout the globe. Did you travel into the winter landscapes? Arnosky: Well, I couldn’t get to the Antarctic and couldn’t get to the Arctic. My concern wasn’t that yet another writer would go to the Arctic and see it and then turn around and tell us what’s there. My concern was, do children even know what this place is, or where it is? The biggest, most important thing I could tell children was that the Arctic is an ocean for the most part, with the North Pole is in the frozen center of it, and that Antarctic is a continent. B: And that there are animals at either end. A: That ‘s right. In the Antarctic you have the shoreline of this massive frozen continent, and in the Arctic you have this beautiful, incredible north country, all the way around the ocean up there. You also have the ocean in the Arctic, which has lots of animals in it. Whereas the heart of Antarctica is desolate. It’s so cold and it’s so uninhabitable—it’s an entirely different place, not just upside down Arctic. I think children have to understand why we have winter–because of the tilt of our axis. What makes winter where you live? What makes winter where somebody in Argentina lives? When winter happens, what survives it? What’s under that ice? So you have all these different layers of one subject that I wanted to try and get in the book. I started at my home, and went out as far as I could go, and then came right back to my farm, my home, and my winter. I wanted to explain winter and cold weather to children, and how remarkable it is that animals can survive in these changes—you know, without having the benefit of heated homes or clothing like we have. B: Well, some do, like the beaver, I had no idea they stay warm by building lodges. A: Yes, they have a chimney in the thing because they don’t put mud around the top, so it’s just wood piled on wood from the center, but the beavers pack mud around the wood so that the air can’t get out. However, the air can go straight up. 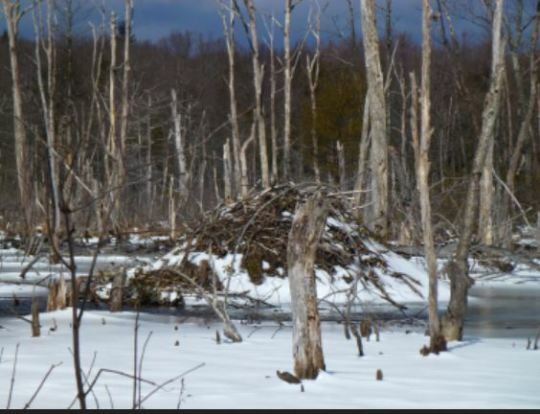 And when the temperature dips to ten below, which we get a lot of back here in northern Vermont, you can actually see the steam, the body heat coming out of the top of the beaver lodges. When I wanted to sketch a beaver lodge in winter, I had to snowshoe down to it. Perhaps this was foolish, but when I got to the pond, I expected that the ice would be thick. As I snowshoed across the pond, the ice broke, and I fell in. I was lucky in the sense that I had always used this certain kind of a hitch—it’s a figure-eight hitch on my snowshoes rather than buckles. If those shoes had been buckled to my feet I would have drowned, but with mine, a circular turn of the foot releases you from the shoe. So I lived. This is all part of the experience of creating a story, and in my field as a naturalist, it’s doubly important to go out into nature and observe it firsthand. B: You don’t mention climate change or global warming in the text, but you do cite quite a few books about it in your notes. Is that a conversation you think children should be having? You don’t want to scare kids, but is a topic children should at least be aware of? A: Well, unfortunately I think that global warming is a subject that remains misunderstood because a lot of people respond to it by things they see on television. B: And it gets very political. A: And politics boggles it all up in people’s minds. I’ve been asked twice to write a book about global warming, and in both cases I said no. You have to write about global warming properly. You have to write about what happens to our northern oceans and southern oceans when freshwater mixes with salt water in too large a quantity. You have to talk about whether or not people or animals are in danger in by it, because in some cases, the animals just simply migrate someplace else. You have to talk about whether or not we think animals like polar bears might move a little further south eventually, at least those that survive. We don’t know a lot about it. And I thought that’s an awful lot for me to squeeze into thirty-two pages of a picture book, when I’m just trying to tell children what winter is. 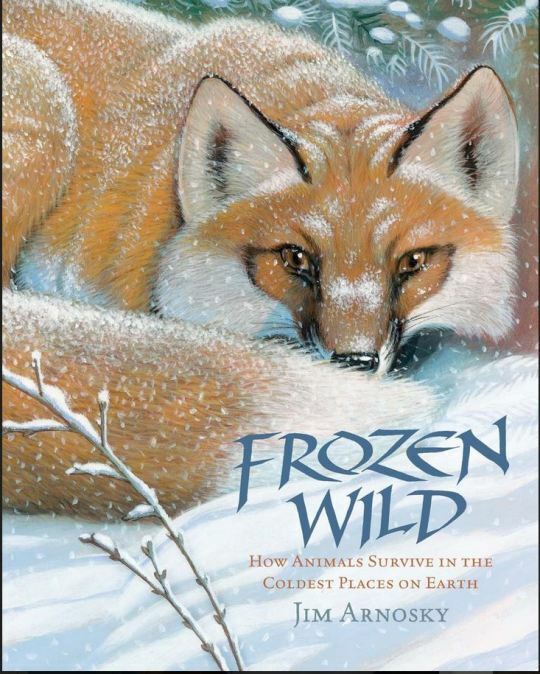 This is a book about what we already know about, and that was my goal—to write a book about what makes it cold outside, and how the animals survive in that cold. So I thought talking about climate change in the middle of the book would throw the whole thrust off, which I explained to my editor. And she suggested I write about it in an author’s note at the end. B: Do you have a favorite animal? Wood duck image source: Wikimedia Commons. A: I’ll always love wood ducks. I’ve painted them, and I’ve drawn them, but it’s never as beautiful as the actual wood duck. I can’t duplicate what nature has done. They have a plume behind their head, they have a multi-colored bill. There’s an iridescence to them. They can look black, green, very much like a mallard in that case, then they’re almost like the harlequin duck. Yet, when you see them in their habitat, they blend perfectly! 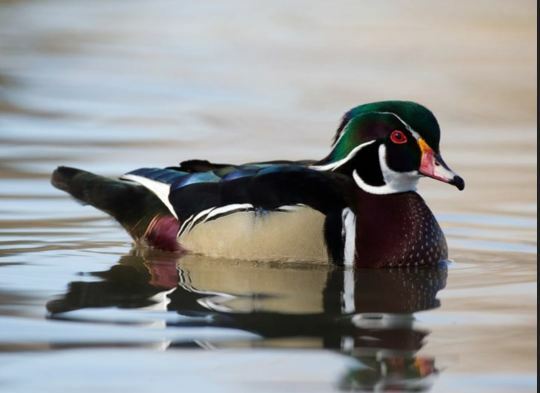 The wood duck was on the verge of extinction because of its beauty. It made a wonderful mount for duck hunters. It came back because people kept private flocks of them on their property. Their wings were clipped so they couldn’t fly away. And yet, some must not have been clipped right, because some of the wood ducks flew away, and they ended up repopulating their entire range. There are lots of animal stories like that–crocodiles, beavers, deer. Anytime you give an animal a chance to rebound, they will, and in a big way. Alice sketch. Reproduced with permission from Grahame Baker-Smith. Stamp reproduction from British Royal Mail. Rabbit sketch. Reproduced with permission from Grahame Baker-Smith. Lewis Carroll’s classic Alice in Wonderland celebrates 150 consecutive years in print, and it seems every where you look, there’s a book, exhibit, or documentary extolling the various virtues of this timeless tale. Even the British Royal Mail Service got into the spirit by commissioning a special series of stamps. The work was completed by none other than Kate Greenaway Medalist Grahame Baker-Smith. Regular readers of this site might recognize the name: In 2013 Baker-Smith illustrated an edition of The Selfish Giant (Folio Society), and we spoke then about his work. (You can read the conversation here.) Once again, the illustrator generously answered a few more of my questions and sent some stunning sketches he prepared for this most recent assignment. Join me down the rabbit hole with Grahame Baker-Smith as we talk about inspiration, design, and illustrating a legacy. Well spotted Barbara! My ‘muse’ for Alice was my youngest daughter, Lillie. She very patiently and graciously let me take pictures of her doing things like pretending she was falling down a rabbit hole or being squished in the White Rabbit’s house – for which she had to sit scrunched up beneath my table. Lillie is actually very dark-haired but the Royal Mail wanted a light brown hair color, so in the stamps she looks to me like Lillie but wearing a wig. How did you choose which scenes to create? The Royal Mail left the composition to me but had a ‘shopping list’ of scenes they wanted covered. It was a shame there couldn’t have been more than ten designs as characters like the Caterpillar and Tweedle Dum and Tweedle Dee had to be left out. After 150 years, there’s been plenty of variations in art for the book. What’s it like tackling such a legacy? What was your work medium? Well, everything begins with drawing, lots of drawing, in pencil, crayon, and pen. I tend to paint faces and other parts in acrylic. These are scanned into Photoshop and the rest of the design is built around it using Photoshop vector tools and brushes. I used crisp, clean shapes in Photoshop and minimal texture because of the size of the finished stamp. I needed something that would be very defined and positive at a small scale. Did you create the pieces on a small scale, or work large and scale down? Again this was a specific part of the brief. The printing of stamps needs to be very fine to hold the color, tones and textures at stamp-size. So the original images were 170 mm square, four times the size of the finished article. The DPI or print resolution was 600, usually 300 DPI is standard for print. I didn’t read Alice growing up. It’s one of those stories that, because of endless adaptations, you feel you know even if you’ve never read the book all the way through. I haven’t read it all the way through even now – I really should! As for illustrations, Tenniel’s are so much a part of the whole legend of Alice it’s difficult to think of it without seeing his version; I also think they are marvelous illustrations anyway. How do you perceive this story – I’ve spoken to some illustrators who viewed the tale as a whimsical fantasy, and others who saw nothing but a total nightmare, and illustrated it as such. When I read the chapters pertaining to the scenes I had to illustrate I was enchanted by Carroll’s imagination, it seemed wild and unhinged. The feeling was of someone so in command of his literary prowess that he could conjure virtually anything into being and somehow make it work. I also felt there was an underlying truth that held it together and gave it – despite the utter madness – a gravity. It has something to say about the contrariness of people, the randomness of life and events. Characters like the Cheshire Cat seem to know so much about other people and the way the world really works while the Queen and King, with all the trappings of power, are unconscious beings who, through being unaware cause chaos and feel quite destructive and dangerous individuals. Grahame Baker-Smith’s commemorate stamps are available through the British Royal Mail here, and the book, Alice’s Adventures in Wonderland, published by Candlewick Press, is available for $8.99.